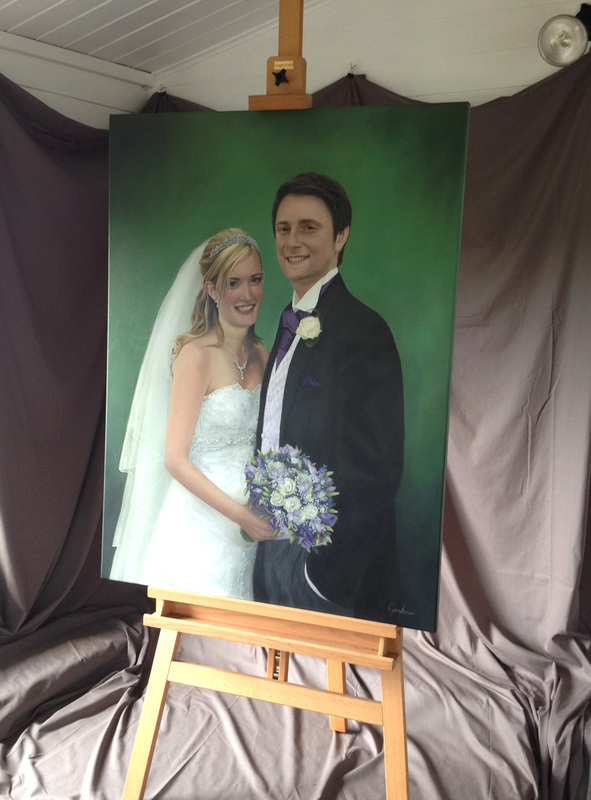 After months of work in front of the easel I am delighted that the wedding portrait painting is finally finished. 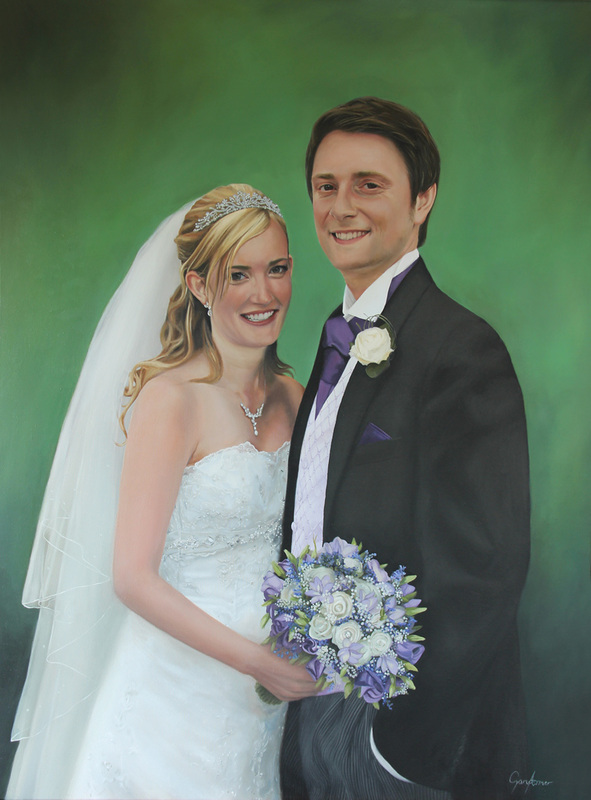 The portrait celebrates the marriage of Mr and Mrs James and strives to capture the happy couple in all their finery on their big day. 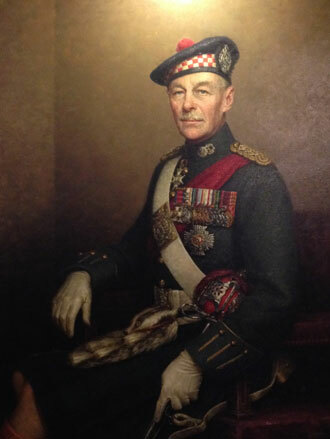 Painted in oil on a 40” x 30” cotton canvas I worked predominantly from photographs for the portrait. On the wedding day I took a number of photos which I would use as references for the piece. The best shots for the portrait were captured in a soft natural light in the grounds of their wedding venue – the fabulous Eaves Hall in Clitheroe, Lancashire. By referring to a number of reference photos I was able to create a composition that I thought worked well with the bride and groom together in a formal but relaxed pose. Early on in the creation of the portrait I decided it might be interesting to document the progress of this particular painting through my blog. I discussed the various stages in a series of seven parts which I’ve listed links to below. 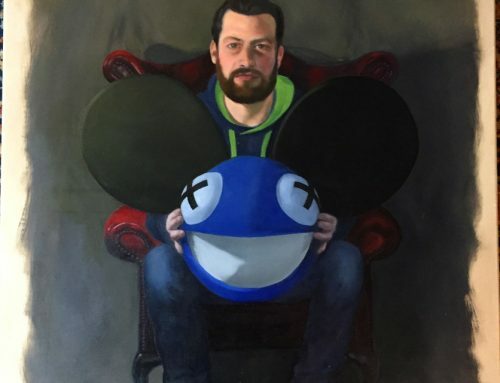 Looking back through the updates it’s interesting to see how the painting progressed as I built up the layers and glazes of oil paint. 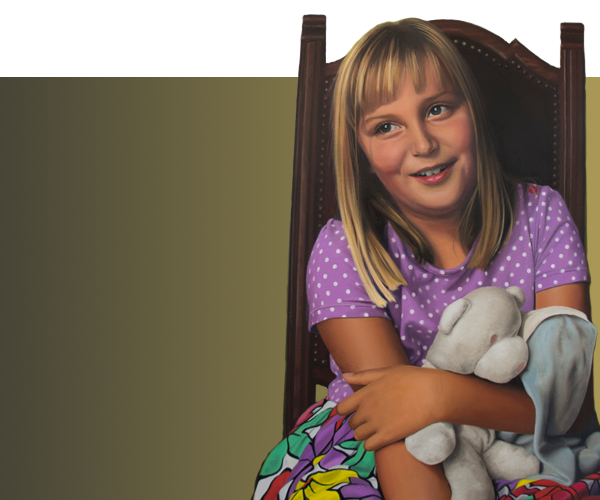 In the early stages the painting seems to jump forward as I block in the bride and groom and key parts of their attire. 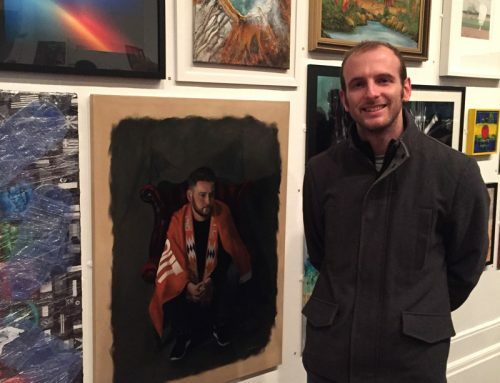 The time consuming parts of the piece were tackled in the latter stages as I honed in on the details. 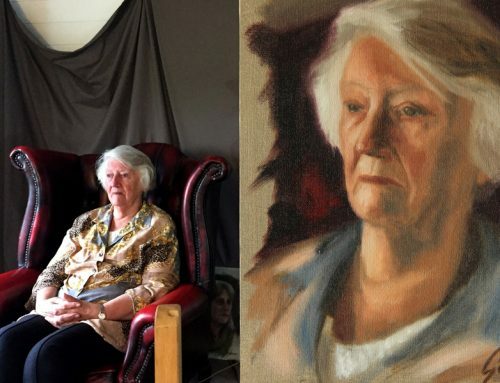 As with any portrait, capturing a good likeness of the subjects was crucial but this painting had to do a lot more. Brilliant weddings only come to fruition after meticulous planning and paying serious attention to detail. It is these fine details that can help make the day extra special and so I needed to ensure that the bride and groom’s wedding attire was totally accurate. 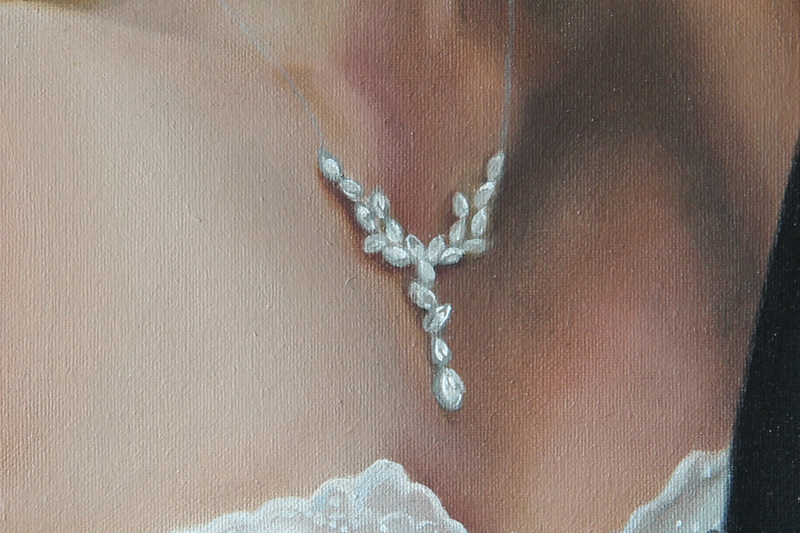 The tiara, necklace and wedding dress were a challenge to paint but one that I thoroughly enjoyed. 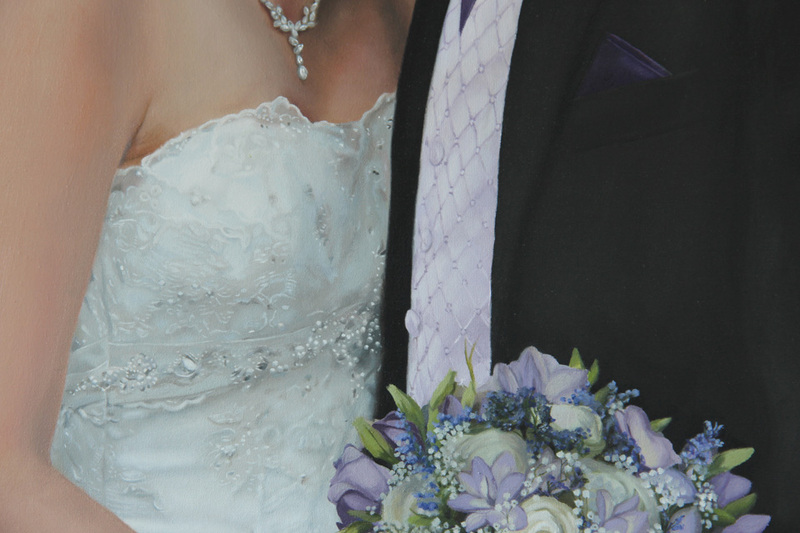 The groom’s buttonhole and bride’s bouquet were also a pleasure to capture on canvas but only after I’d accurately mixed the purples and ivory that made up the wedding colour scheme. 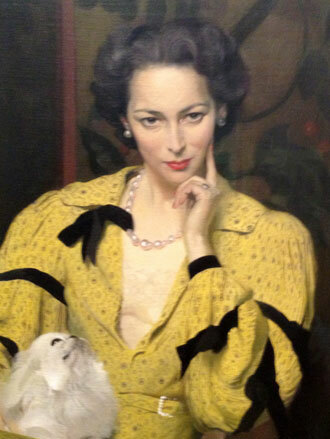 Detail of the Bride’s necklace. 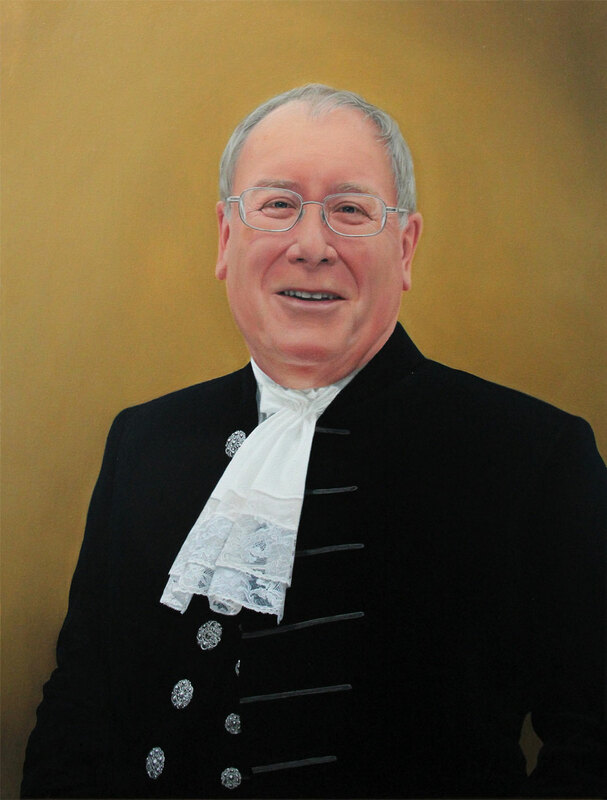 You can see additional photos of the completed portrait over in my portfolio.